Weighs only 45 lbs. (without the batteries installed). Folds down to a height of just 12.25”. Batteries are stored in a pouch under the seat and must be removed before checking into an airline and brought on board the aircraft in the pouch. As an example of this new generation of lightweight, foldable wheelchairs, it comes with a lot of worthwhile features, at a very reasonable price. But consider the shortcomings mentioned! People like myself, who face physical challenges but still want to participate in life, appreciate what a gamechanger a well-built, lightweight, portable wheelchair can be. The EZ Lite Cruiser Lightweight Foldable Wheelchair might fit the bill. 1. Because the frame of this wheelchair is made up of an aluminum alloy, which is both durable and lightweight, it can accomodate up to 265 lbs. and still weighs only 45 lbs. (without the batteries installed) and folds down to a height of just 12.25”, making it very easy to store in the trunk of most cars. 2. It has a very acceptable turning radius of 29.25”. 3. A terrific ground clearance of 3.9″, making it easy to cross grass or uneven ground. 4. The EZ Lite Cruiser Standard comes with a 10 Ah Lithium-ion battery which gives a driving range of 12+ miles and it is possible to connect two batteries for a range of 24+ miles. Also it is possible to use one 15 Ah Lithium-ion battery (expensive!) for an 18+ miles range or use two 15 Ah for a 36+ range BUT, AND IT IS A BIG BUT, the DOT (Department of Transportation) does not allow 15 Ah Lithium-Ion batteries on airplanes. So while it would be nice to have two 10Ah and two 15 Ah batteries do remember that Lithium-ion batteries do not come cheap. 5. The EZ Lite Cruiser Lightweight Foldable Wheelchair stands upright on the rear wheels when folded yet unfolds very easily when lifted up by the back support, has a top speed of 5 mph and weighs in at 45 lbs, without a battery attached (add 6.5 lbs for each 10 Ah or 10.3 lbs for each 15 Ah battery) which makes it quite a bit lighter than other models available in its class! 6. It has a removable seat, which makes cleaning very easy. The armrests can also be adjusted to suit personal comfort and can be raised for easy access to the seat. A seatbelt and anti-tip wheels are supplied. 7. The Advanced LiFePO4 Lithium-ion battery can be recharged up to 1000 times which means that, depending on how often you need to recharge, you should have to replace the battery only once every three to five years. 8. One outstanding feature of the EZ Lite Cruiser Lightweight Foldable Wheelchair is that it allows you to tap into a wide range of accessories such as a smart phone and tablet holder, a dual port USB charger which allows you to charge your personal electronic devices right from the batteries in your wheelchair, an oxygen bag holder, a footrest extension, etc. 9. Another feature I like is the 8” wheels on the back, providing good stability and shock absorption. I have to say that it is hard to appreciate how important “shock absorption” is until you’ve traveled a few miles on uneven ground or broken sidewalk in a wheelchair. 10. The joystick can be mounted on either armrests. 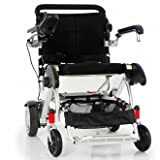 And here’s a major plus – EZ Lite Cruiser Lightweight Foldable Wheelchair offers a “caregiver joystick mount” accessory which can be attached with ease to the frame of the chair so the caregiver can control the speed and direction of the chair from behind. Simply attach the accessory using the fastening clamp and insert the joystick/controller. This feature is really helpful if the user does not have the strength or dexterity to control the wheelchair themselves. The frame has a warranty of ten years, the motor for five years, the battery, CPU (ie the computer) and joystick are guaranteed for two years and the wearable parts such as the seat, tires, backrest and armrests for three months. One disadvantage, however, of the EZ Lite Cruiser Lightweight Foldable Wheelchair is that instead of the battery holders being built into the frame of the wheelchair, as with other models in this category, they are stored in a pouch under the seat and must be removed before checking into an airline and brought on board the aircraft in the provided pouch and, like I said earlier, 15 Ah batteries are not allowed on airplanes at all. Also, the Travel Bag (available as an accessory) is essential when traveling. So, in a nutshell, as an example of this new generation of lightweight, foldable wheelchairs, the EZ Lite Cruiser Standard is a very decent model, with a lot of worthwhile features, available at a very reasonable price. But consider the shortcomings I mentioned, such as the fact that the batteries are stored in a pouch under the seat. So please weigh the pros and cons before purchasing this wheelchair. (A Heavy Duty model, the Deluxe DX12, with a maximum weight capacity of 330 pounds is available that weighs 58 lbs. [without the batteries installed] and has a top speed of 5 mph. One outstanding feature of the Deluxe DX12 that is often sadly lacking in other wheelchairs, is that the back rest has the ability to recline through five pre-set positions, up to an angle of 140°. And with the headrest attachment (available as an accessory) providing support for your neck and head, it’s possible to even take a snooze! © 2017 BarriersGone.com. All Rights Reserved.